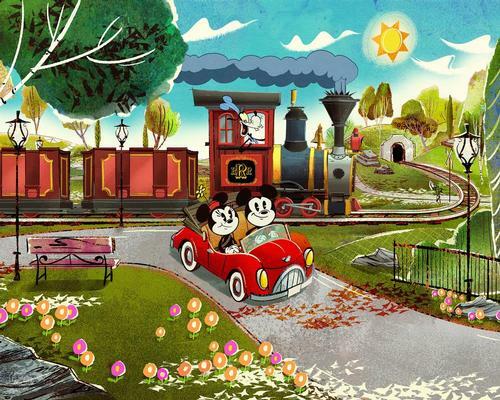 Disney has released new details of it's new Mickey & Minnie's Runaway Railway attraction. Set to open in Fall 2019 at Disney's Hollywood Studios in the Walt Disney World Resort, Florida, Mickey & Minnie's Runaway Railway dark ride is billed as a 'zany out-of-control adventure', where guests will find themselves transported into a Mickey Mouse cartoon. It will feature new '2 & ½ D' technology, essentially 3D without glasses, as well as projectors and breakthrough technologies from Japanese electronics giant, Panasonic. Named as the 'Official Projection Technology' for both the Walt Disney World and Disneyland Resorts in 2016, Panasonic already has a significant technological presence in attractions across the resorts, including the Finding Nemo Submarine Voyage at Disneyland; the Radiator Springs Racers at Disney California Adventure Park; the Haunted Mansion and Seven Dwarfs Mine Train at Magic Kingdom; Frozen Ever After and Gran Fiesta Tour starring The Three Caballeros at Epcot; and the Na'vi River Journey at Pandora - The World of Avatar at Disney's Animal Kingdom. Ron Martin, director at Panasonic Hollywood Laboratory, a division of the Panasonic Corporation in North America, said: "We are pleased to have the opportunity to once again provide cutting-edge projection technology for the first ever ride-through Mickey Mouse attraction. "Panasonic is proud to help Disney Parks immerse their guests in the animated world of Mickey Mouse and Minnie Mouse in a way that has never been done before," Martin added. Tom LaDuke, principal show systems designer at Walt Disney Imagineering, said: "The specific visual requirements of Mickey & Minnie's Runaway Railway attraction require imaging systems that meet the highest technical requirements of prevision colour rendition and brightness. "Panasonic's laser illuminated projectors do that extremely well. We look forward to working with Panasonic to pusch technological boundaries that bring our guests to places only previously achieved in their imaginations," LaDuke added.